The BMABA is now White Ribbon Certified! 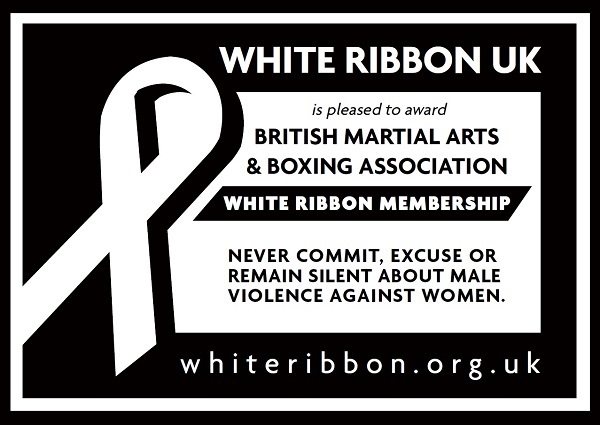 We’re immensely proud to announce that the British Martial Arts & Boxing Association (BMABA) has now obtained White Ribbon Certification, and will be shortly rolling out initiatives and instructor qualifications to progress this hugely important cause through martial arts. White Ribbon’s mission is to end male violence against women, once and for all. They work with men and boys to challenge those male cultures that lead to harassment, abuse and violence. Their volunteer ambassadors engage with other men and boys to call out such behaviour among their peers and promote a culture of equality and respect. As an association, and as martial artists, this feels like a superb fit with our objectives. We’ve been championing everyone having self defence skills since 2012, and to ensure we’re specifically doing our bit to tackle male violence against women and girls is, to us, incredibly important. For our instructors we’ll shortly be rolling out initiatives to help you get involved, become an ambassador or champion, as well as introducing a new national scheme to help martial arts further White Ribbon’s objective (more to follow during February). Keep an eye open for our new announcements on initiatives and programs, anticipated during February for more. In the interim, you can learn more about White Ribbon from here. Prev:We’re now registered with the NCVO!